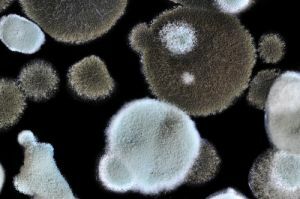 Molds are the most common form of fungi on Earth, growing both indoors and outdoors. Most kinds are helpful and important for breaking down material in nature and turning them into compost for new growth. Problems develop when it starts to grow on materials inside buildings and starts to damage or destroy them, or when it causes allergies or health issues to residents or tenants. Although mold and mildew are often used as interchangeable terms, scientifically, mildew refers to the type of fungus that grows on plants (such as powdery mildew on roses). Although people often call the fungi that grow in their bathroom or on their clothes "mildew" technically it is mold. No matter which you call it, if you need information about how to deal with it — whether indoors, outdoors, in your vehicle or on various materials, we can help. Are bleach-based mold stain cleaners still the best solution for the job? Bleach-based formulas are still the best at removing stains caused by mold, mildew and algae. Bleach gives an instant clean to cut down on your cleaning time. In most cases it requires no scrubbing. Will the formulas hurt my plants and shrubs? No, the formulas will not hurt your plants and shrubs if you spray them down with water before and after you clean. What is a Mold Blocker? A mold blocker leaves an invisible barrier to prevent the growth of mold over time. It makes the clean last longer. The Mold Blocker can be used on all types of surfaces – both hard and soft to effectively inhibit mold stains. As always, test on an inconspicuous area first to be sure the formula will not harm the surface. Are these products safe for most surfaces? It is important that you read the label on each product as we recommend which surfaces to use it on. We do not recommend the use of bleach based products on natural marble. You should rinse immediately if you use the product on rubber and old porcelain.